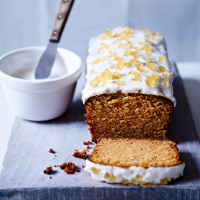 This fantastic gluten-free cake is sweet and squidgy in the middle with a cool ginger icing on top. The stem ginger syrup is made with white sugar, but you could replace it with maple syrup or honey to make this recipe refined sugar free, too. 1 Preheat the oven to 170 ̊c, gas mark 3; grease and line a 900g loaf tin. cover the dates with boiling water; leave for 10 minutes. drain and whizz in a food processor with the butter, ginger and maple syrup until smooth. add the eggs, then whizz to combine. add the dry ingredients and whizz until just combined. 2 Tip into the prepared tin, level out the top and bake for 1 hour, until a skewer inserted into the centre comes out clean. (cover with foil for the last 10 minutes if it browns too fast.) leave to cool completely in the tin. 3 For the icing, soak the dates in 75ml boiling water for 10 minutes, then tip into a blender (ideally a high-speed blender or nutribullet, or use the small bowl of a food processor). add the ginger syrup, ground ginger and a pinch of salt, then blend until smooth; cool completely. using electric beaters, whip the soft cheese briefly, then whip in the date mix. ice the loaf and top with extra stem ginger. This recipe was first published in Fri May 01 14:28:00 BST 2015.